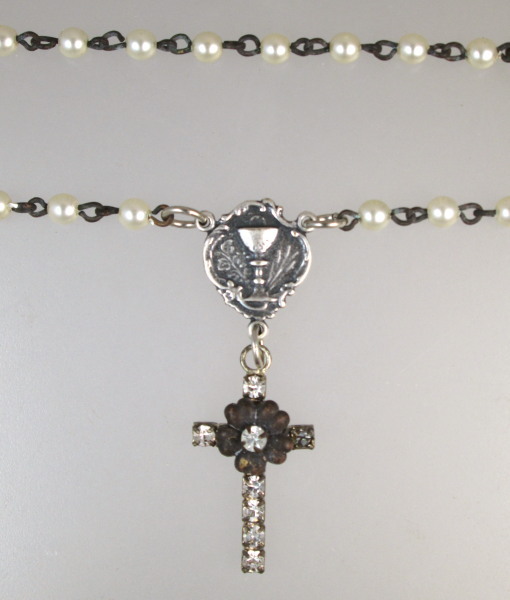 A Lovely first Communion Rhinestone Cross with a floral center on delicate Pearls. Just in time for that 1st Holy Communion. The Cross is suspended from a Sterling Silverplated 3 Way medal with a Communion Chalice. The reverse says, "Remembrance of my First Holy Communion." Measurements~ Beads measure 18", PendantÂ is 1.75"Â long.